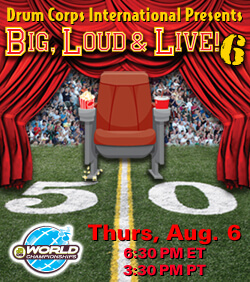 Drum Corps International's sixth annual "BIG, LOUD & LIVE" broadcast of the World Championship Quarterfinals will be coming to nearly 400 theaters nationwide this Thursday, Aug. 6! Don't get left out in the movie theater parking lot on the day of the show! Order your tickets today as you get set to bring your friends, family, coworkers and drum corps pals to this special one-night LIVE event on Thursday, Aug. 6 starting at 6:30 p.m. ET. Find a theater and order tickets through FathomEvents.com. Learn more about "Big, Loud & Live 6." Learn more about the 2009 Drum Corps International World Championships.